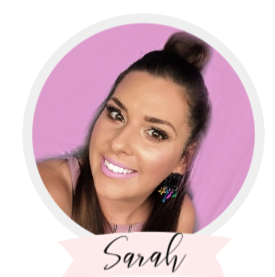 I wasn't sure if I should write this post as a series, but now that I am only one week away from completing the course, I thought I would dedicate a post to the Certificate II in Retail, Skincare and Makeup and write about my experiences studying this course with the Australian Institute of Creative Design. 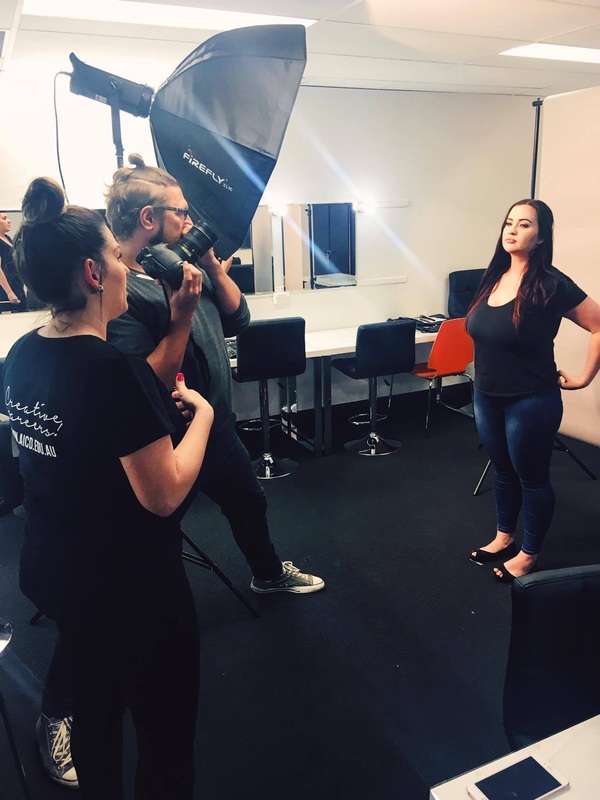 If you are interested in doing a makeup course, perhaps you may want to work on a makeup counter or take the first step to start your own freelance career, keep reading to find out more about this course! If you are working full-time, maybe you're a stay at home mom, or you work/study part-time, the Diploma of Specialist Makeup Services just might not be realistic for you. When I was looking to begin a makeup course, this was the case for me as well. Through my research, the diploma seemed to be the "standard" in certification for many freelance makeup artists but this was something that I couldn't afford both financially and timewise. 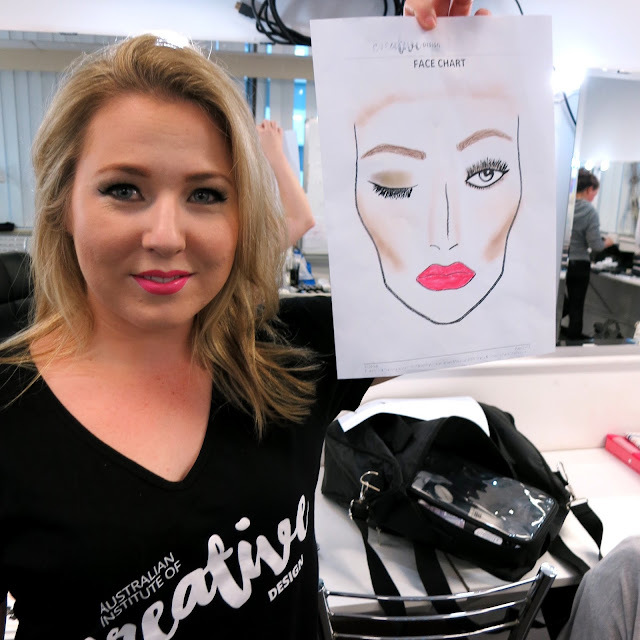 I started to do a lot more research into alternative options for makeup courses in Brisbane. There isn't a whole lot between a one day course, and a full Diploma of Makeup besides the Certificate II in Retail, Makeup and Skincare. There were also online options, but I just had a feeling that without the practical work, I wasn't going to gain much hands on industry knowledge. It was really difficult to find personal reviews revealing how others have experienced the course and expectations around the workload. I ended up diving right in and signing up for the course after reading several positive reviews on the Facebook page of AICD. I was also swayed as they offered the certificate over 16 weeks on Saturdays only, which was something that I figured I could slot into my life without disrupting my Monday-Friday job. It was by far the best decision I have ever made when it comes to my makeup career. I work full-time, but aspire to do freelance makeup on weekends and evenings, maybe even eventually working less in my current job to have a weekday available. I know my stuff when it comes to beauty - I know makeup brands and I have a high level of knowledge of new makeup products and releases. However, there is nothing like hands-on experience and getting to practice on others in an intensive learning environment. It has also been great to speak with some of the other facilitators, many of them practicing MUA's who can provide great tips and tricks they have learned working in the industry. I was told by many fellow makeup artists in online forums that the Certificate II in Makeup was quite "basic" and "you probably won't get much out of it" ... I ignored these comments. I am certainly glad that I did because the course is quite comprehensive, covers a lot of ground and is fairly fast-paced, yet provides a great environment for learning. As I mentioned, the Diploma of Makeup was out of my price range, which was another reason I wanted to do something that was a little shorter, and less expensive. 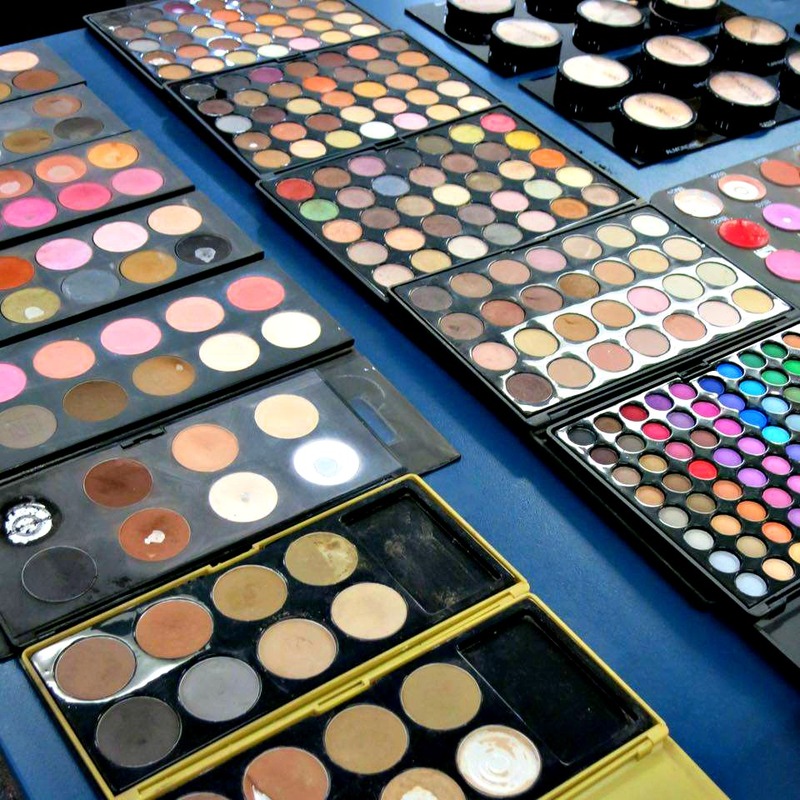 The Certificate II in Retail, Makeup and Skincare costs $1850, with a non refundable enrollment fee/deposit of $200. You can pay off this balance with weekly direct debit installments which works out to be $110 per week which is quite affordable. You also have to pay $250 for your kit. Overall, for the high quality of the classes and the length of this course, I think this is a really reasonable price and it is worth the money in my opinion. All of the theory, and materials to study are available in electronic form. You are given a link to download them when you sign up, which includes thing like face chart templates, PLI charts, and your assessment guide and class schedule. It's great because you don't need to waste any money on textbooks! The kits which are included in your tuition are quite good, but they are basic. 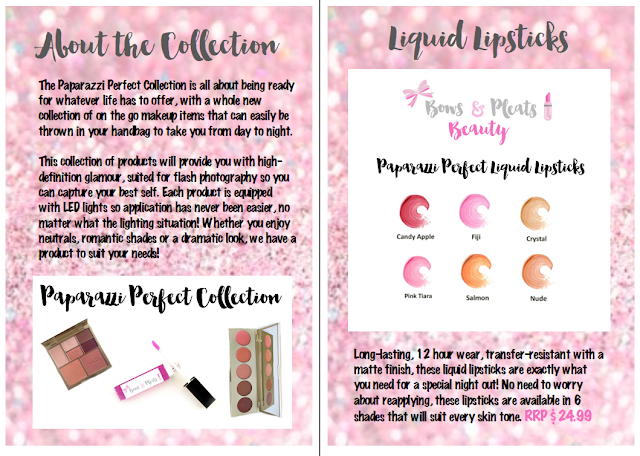 You have access to all the makeup resources within the classroom, but you are expected to regularly be practicing makeup outside of the classroom so there are some products you will need to add to your kit in order to do this. One of the main items I would suggest you invest in would be a decent brush set. The one that we received with our kit constantly sheds hairs, even after a deep cleanse and I found the brushes to be of a very poor quality. I had the luxury of having enough brushes that I added in my own from my personal stash and ensured they were 100% sanitary. It would also be worth investing in a foundation palette or a 4-5 shades of your preferred foundation brand for practicing on others and for the future if you decide to pursue freelance. I convinced a few ladies in my class to invest in the RCMA foundation palette, which is a great palette that covers all skin tones both in class, and for your freelance work. AICD provides MUFE HD Foundation once students have reached week 9 for use in class. By this stage in the course, students have gained enough knowledge and skill to properly decant these expensive products without wasting them. Prior to that, the foundation in class can be quite difficult to work with and doesn't always produce favorable results, which can be frustrating but nevertheless it is still there for you if you need something to practice with. Things such as facial moisturiser, primer, pressed powders, additional disposables, disposable cotton tips, cotton pads, tweezers, additional false lashes, foundation, lipsticks or a lip palette, etc should all be bought to add to your kit for use outside of class to practice your makeup looks. These are all provided in class if you need them, but it's always a good practice to start building up your kit so you aren't reliant on class supplies. My class schedule was one day a week each Saturday from 9am - 3:30pm with a 45 minute break for lunch. 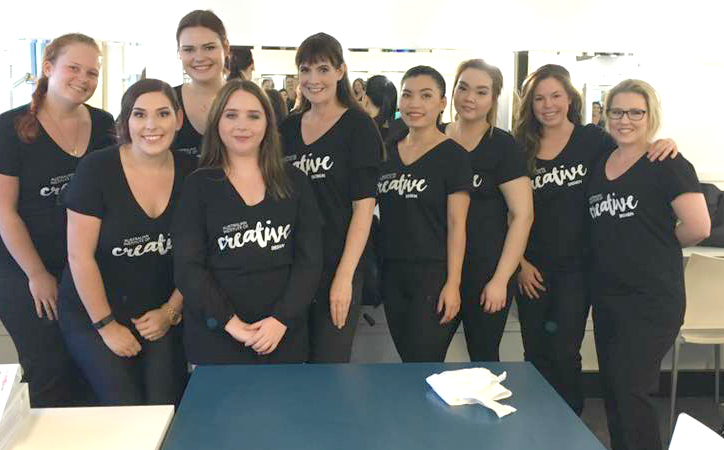 Each week consists of 50% makeup theory, and 50% practical, with a demo from the trainer demonstrating the particular makeup look which is the focus of the class such as traditional smokey eye or daytime/natural makeup look. I personally really loved this layout. Typically, we would read through the theory together and discuss the content through conversations about today's current trends such as the way looks are influenced by social media platforms like instagram. 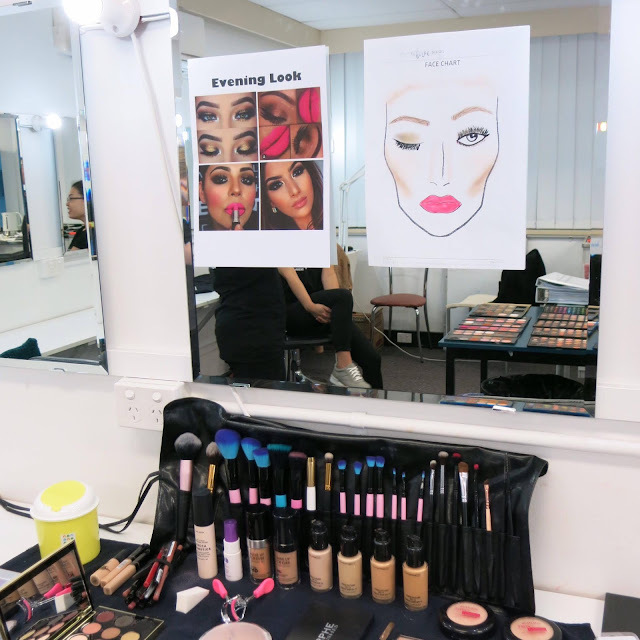 Setting up for an evening look with inspiration images & face chart! After the demo, you are given the chance to practice the given look with the other students in the class. Each week you will try to pair up with someone different so you can test your makeup skills and attempt to work on different skin types and tones. Your confidence levels build up each week, and although you may start off not really knowing what you are doing and maybe feeling outside of your comfort zone, with constructive feedback after each practice session, you start to figure out tips and tricks to apply to improve your skills more and more. Makeup is all about giving things a try, and learning how you can improve each time. The only written assessment/exam is an open-book style assessment which goes through 60 multiple choice questions based on the theory in the workbooks provided. As the weeks go on, you start to create looks which will be placed into one of your final assessments, your portfolio. 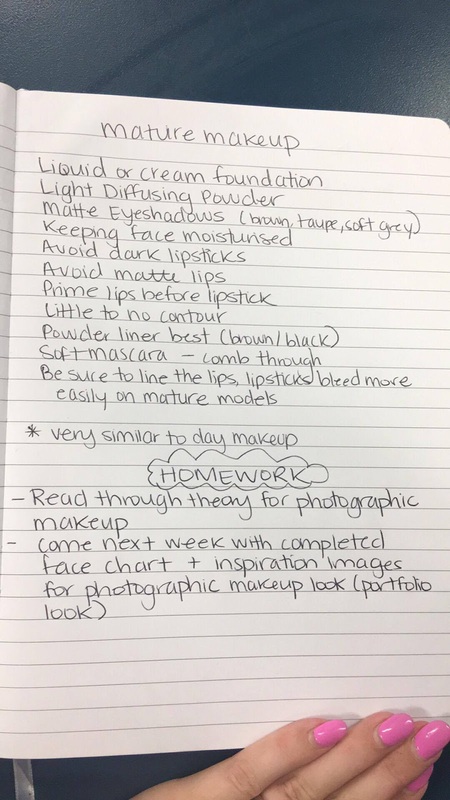 Your portfolio is basically a binder that contains your five makeup looks which are graded for the course. These are: Day Makeup, Evening Makeup, Mature Makeup, Photographic Makeup, and Bridal Makeup. 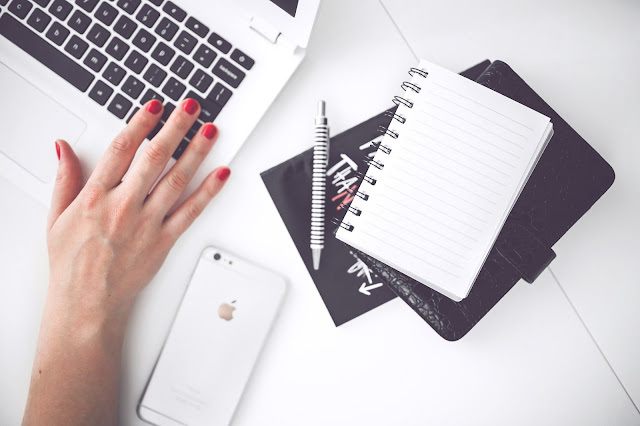 You include things such as Face Charts, PLI Charts, Client Consultation Forms, Before and After photos of your client as well as your reflections on how you think you achieved each look and how you could improve for next time. Some of these looks are done on fellow classmates, while others require models to be brought in where you are formally assessed on your client care and timed for the makeup application to ensure you can complete it within the allocated timeframe, usually 60 minutes. 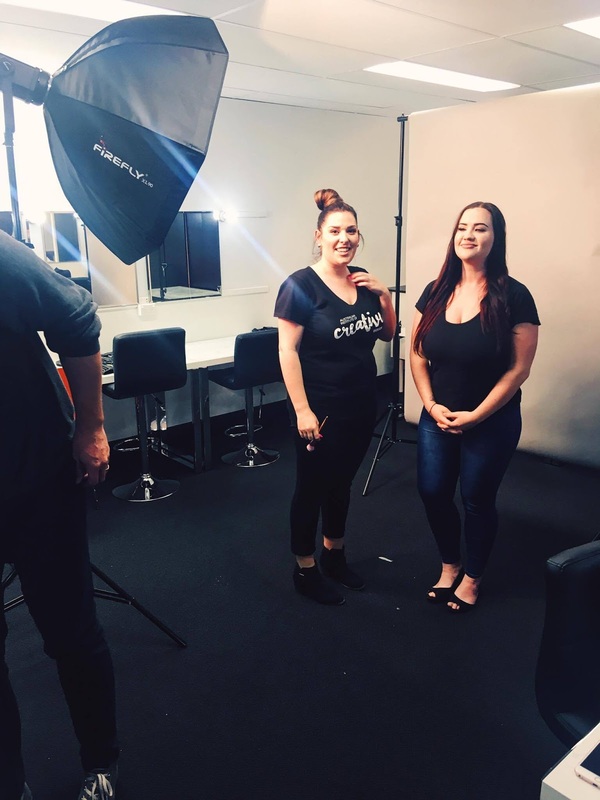 Although the assessments can be a little daunting, they give you a great insight to what it would be like to complete a makeover on a client if you were in a retail environment or even as a freelance makeup artist. 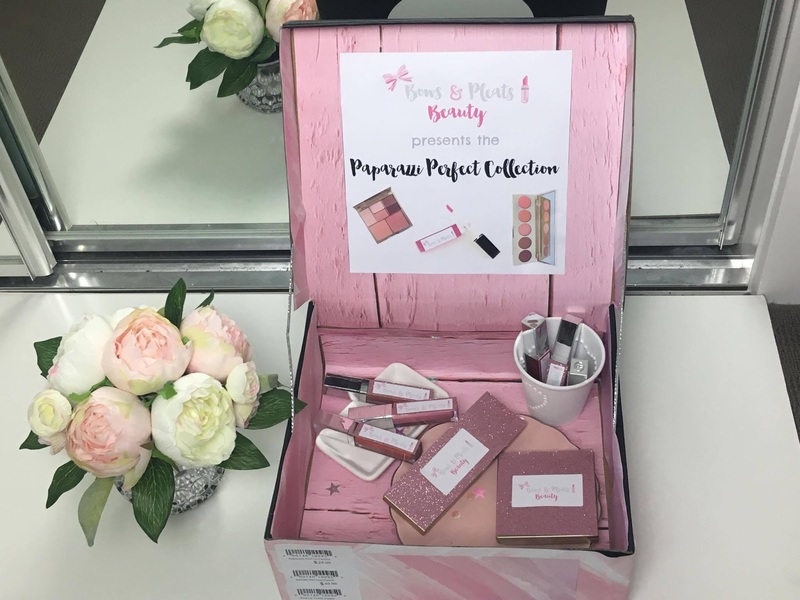 You may need to complete a bridal party in a certain amount of time so this is great practice to build your confidence in speeding up your timing for makeup application. You will also have the opportunity to complete one of your last makeup looks with professional photographs taken by an external photographer that AICD hires for the class. This was an amazing experience for me, and gives you a very real feel of what it would be like to do this in the industry. There is also a final project regarding building your own makeup display which I found very challenging but interesting. It makes you think of a creative way you could come up with your own brand, and how you would sell beauty products if you were the owner of the company. In class, there is an oral presentation where you talk about your brand, the products in your collection and why the store owner should purchase these products to have in their store. This probably isn't something I will use outside of class, but it would be great for those entering the retail world and is also highly linked with marketing/business so if you're studying those subjects, you will probably find this easy. There is a large written aspect that accompanies the display where you outline your target market, purpose of the display, your theme, etc and talk all about the implications of your products. This was a very time-consuming project but the end results from our class were pretty amazing. Each collection was so unique and different. I wanted to buy all the imaginary products by the end of the presentations! If I am 100% honest with you all, the workload was definitely higher than I was originally expecting it to be for this course. There is an expectation that each week you will be making an effort to practice makeup on other people such as friends and family to continue to build up your skills. For each look you complete, you are expected to come with a face chart prepared as well as inspirational images. Your kit has to be 100% cleaned each week, including your products and your brushes. This makes sense, obviously but it does add to the amount of work and dedication you are putting in outside of class. The Create a Display project, the Multiple Choice Test, as well as the Portfolio are mainly completed outside of class, as there is a lot of written work that needs to be typed up. You need to prepare to do this work on weeknights or on the weekend if you can find some time. An example of some notes from class + homework! I gave up a lot of nights out because I knew I had to wake up early for this course. 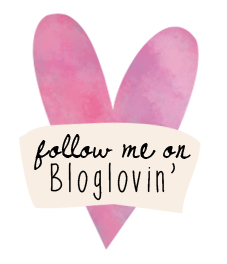 At times, I fell behind on my blog because the workload was so high and I also had to turn down plans with my husband and friends in order to get things completed each week. Don't get me wrong, some weeks you may get everything completed in class and not have any homework, but most weeks you will have 1-2 things you need to do or prepare for class so you need to factor that in when you sign up for this course. We had an amazing class that was 100% committed to achieving a high standard of work so I have to say it was great to have that motivating environment. My favourite aspect of this course was the small class size. We had under 10 people in our class so we have grown to know each other really well and have become friends in just a short amount of time. Every single person has had a chance to practice on each other and experience different skin types, different skintones, different ethnicities and preferences, it has been an amazing journey! That in itself is an invaluable experience. We even made a private Facebook group so we could chat about upcoming assignments, or sort out issues with models, etc. That was a great way for us to stay in touch outside of the classroom. Our trainer Jordan was very friendly, knowledgeable and professional. She understood we were giving up our Saturdays to attend the course so she always tried to make class more fun and enjoyable, giving us more time to practice makeup whenever possible. Jordan was great at showing us demos of how she would complete each look and made sure to add in her knowledge of the makeup industry from her personal experience of doing freelance and completing her Diploma in Makeup. I think one of the biggest unknown factors when you start a makeup course is knowing what the facilitator will be like. We had the chance to meet a few of the other facilitators who were teaching other cert 2 classes or diploma classes, and I can honestly say they have all been so friendly, approachable and knowledgeable so whatever class you choose, if you're studying at AICD, I think you will be in good hands! Overall, I am so happy that I made the decision to sign up for this course. I believe my makeup skills have improved so much and I am just so much more confident when it comes to completing looks in a quick and timely manner. I'm no longer second-guessing myself because I've had so much practice it just comes naturally now. I would highly recommend this course for anyone who is wanting to take the first step in becoming a freelance makeup artist or if you're interested in working on a makeup counter! This course is now called Certificate II In Retail Cosmetics. You can find out more information about this course here, including the next intake dates at both the Brisbane and Gold Coast campuses. I hope this answers most of your questions! Please let me know if you have any other questions in the comments below. Have you ever completed a makeup course? How did you find it?